JAYSUN GLOVE specializes in manufacturing disposable vinyl gloves for 20 years. We currently have two factories: Jiangsu Jaysun Glove Co., Ltd. and Jiangxi Jaysun Medcare Co., Ltd. with totally 36 active production lines, annual capacity can be 5.5 billion pieces, and we currently export around 150*40HQ per month to the world market. Most of our product lines produce medical grade vinyl gloves with powdered and powder-free. Our quality products are highly regarded by Top 500 enterprises of the world.Most of our gloves are exported to US, Japan and Europe for medical and food handling use. Jaysun Glove follows strict quality control processes to meet ASTM D5250-06 of US; EN455-1-2-3, EN420 for Europe; and JIS T9116 of Japan standards. 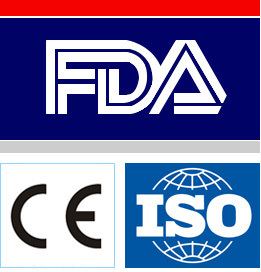 We are ISO9001, ISO13485, ISO14001, FDA and CE certified. 20years of experience in medical gloves production. DEHP free, safe for contact with hot or cold food. Guards against oil, dirt. Acid and alkali resistant.